I would like to learn more about the July 17th rally that is supposed to take place at 10am in the southeastern corner of Independence and First street of Washington DC. I will not be able to attend, but would like to read about it, if at all possible. From my understanding of what this rally entails is that government officials are being put under a spot light to be held accountable for their actions. I think it’s about time for the political party divide to subside and make way to collective thought for unifying America to progress to the future as one. Please email Jerrol LeBaron at Media@honorinoffice.org for press credentials. 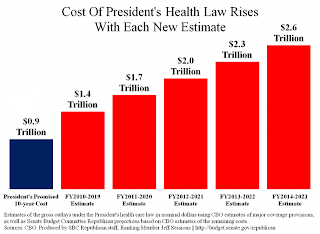 The latest estimate, as the chart details, is that Obamacare will cost $2.6 trillion dollars in its first real decade. 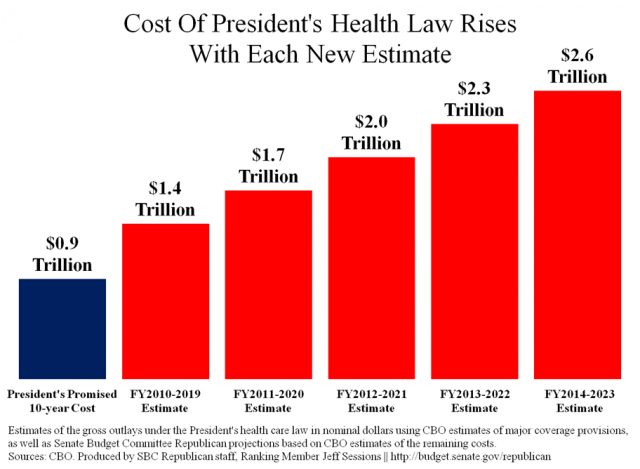 The bill does not fully go into effect until 2014, therefore the estimate begins with that year.